The Surreal Work of Sarolta Bán. Sarolta Bán is a 27 year old self-taught photographer and photo manipulator from Budapest, Hungary. Originally a jewelery designer, Sarolta usually works on an image from a few hours to a couple of days and uses up to 100 different layers for one beautiful picture. See more via Amazing surreal photo manipulations by Sarolta Bán | InspireFirst. Photographers have had fun with long exposure photography in Budapest. And the object of their photography are the amazing Budapest city trams decorated with 30 thousand LED light bulbs. Trams have become one of the latest additions to the fashionable streets in Budapest. See more trams via Wonderful Glowing In Night Trams Budapest. 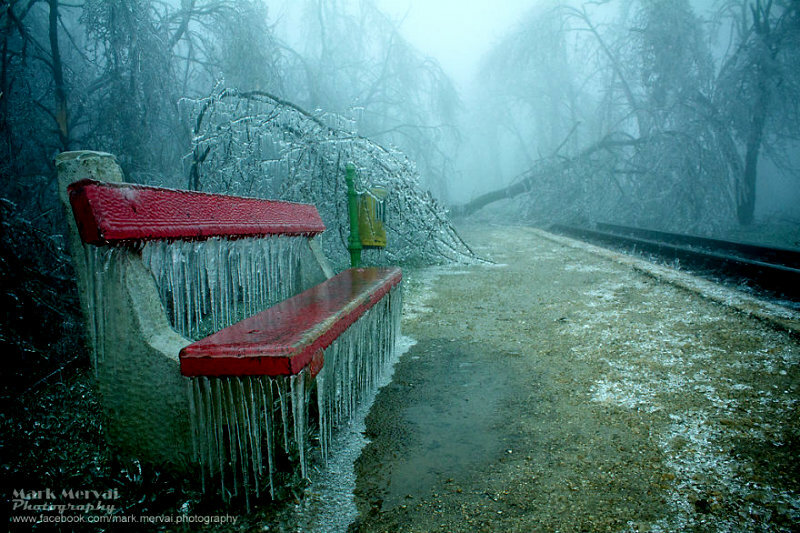 On a Monday afternoon back in December of the year 2014 I got a call from a photographer, that a whole district of Budapest is totally under ice and the trees are falling over because of the ice pressure. At this moment I never thought that this call would end in the most exciting press-work of my whole life. I met with other photographer in the early hours of the following day and we get up the hills of Buda. We just knew one thing – everyone told us “don’t go up there, it’s extremely dangerous”. But we had to. After we exit the bus we saw the first tree falling over, just a few meters away from us. After this awful shock we started our way into little streets, far away from the main street, listening to one sound – the sound of the trees. The sound of branches braking under the weight of Ice. I personally was not afraid, because I knew that I had to do my job. I had to show people the power of nature, so there was no time to think about the consequences. By looking up for nearly the whole time (I had never watched trees and branches for such a long time) I photographed powerful nature to show what it is able to do to helpless people. 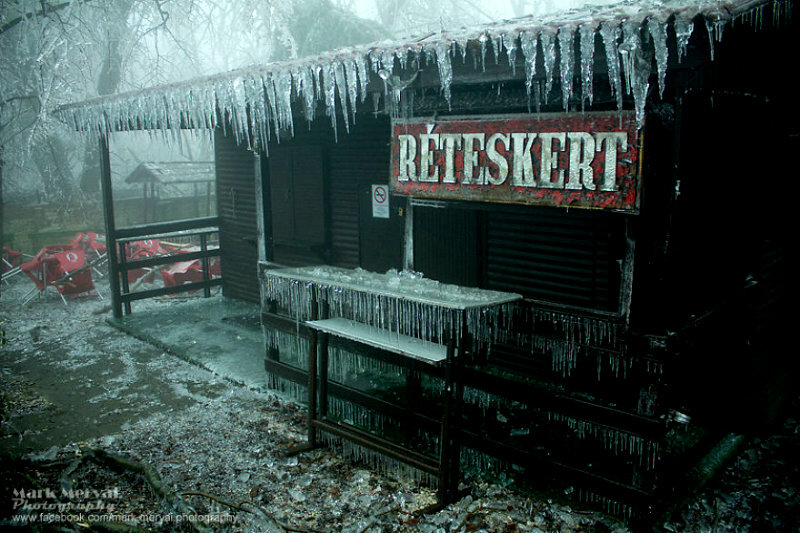 Read on via Frozen Apocalyptic Budapest After Ice Fog | Bored Panda. For 6 years I’ve been climbing Budapest’s most significant buildings, towers, monuments and everything I can to shoot the perfect pictures about my hometown. I even risk my life to take pictures of my hometown in unrepeatable lights and from unbelievable heights. I try to take pictures in different lights and weather conditions because I would like to show everyone how beautiful Budapest is. Originally I am a train driver but my true passion is photography. With that, I would like to show the world how proud I am of the place where I live. 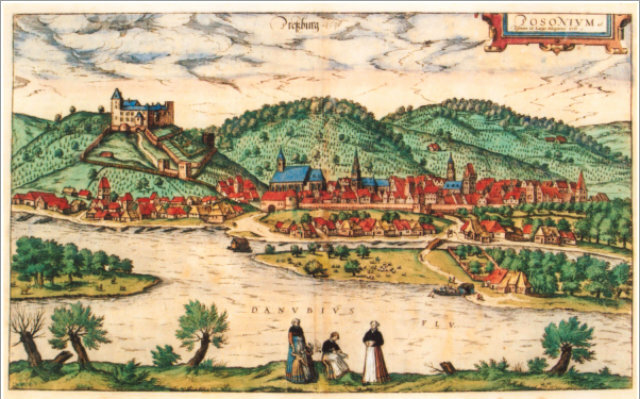 A Copperplate view of Pressburg by Hogenberg 1535-1590. This colored copperplate view of Bratislava (Posonium in Latin, known as Pressburg during the period of the Austrian and Austro-Hungarian Empire) is the oldest and best-known popular depiction of the city. The creator of this edited copy of the print was the German master Franz Hogenberg (1535−90). At the time the print was made, Bratislava was the capital of Hungary and was also a coronation city of the Habsburg rulers. The view depicts the Danube River, dominated by Bratislava Castle, which was a seat of the Hungarian part of the Habsburg monarchy until 1780. An interesting note in the upper-right part of the view mentions Wolfgang Lazius (1514−65), who was an important Hungarian humanist and cartographer and the author of the second oldest map of Hungary (1556). In 1593 this view was used in the book Civitates orbis terrarum. Liber quartus urbium praecipuarum totius mundi (The cities of the world. The fourth book of the principal cities of the world), published in Cologne by Georg Braun and Franz Hogenberg. via Pressburg, Posonium, or Pisonium, a Hungarian City as Depicted by Wolfgang Lazius – World Digital Library.